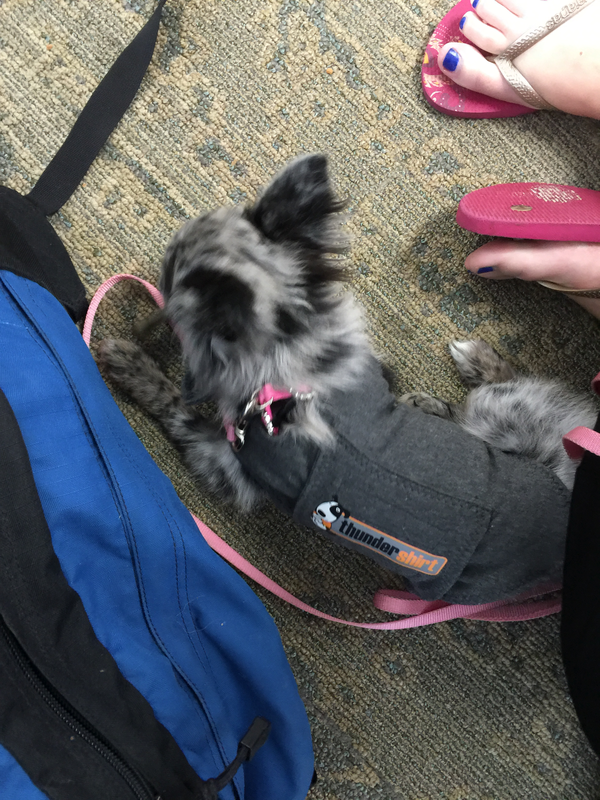 Flying with a puppy provides for a completely new travel experience. As I’m sure you could’ve guessed, it’s not exactly the most relaxing way to travel. I have now flown with Stevie four times, with varying degrees of stress and success. My first piece of advice is to get there early. This might seem obvious since you always want to get to the airport early, but I’m talking two or more hours early for a domestic flight, even in small airports. Early arrival is very important because you have to wait in the “special services” line in order to check in. Usually I have everything taken care of online before the day of my flight and can just head straight to security, but with a pet, I’ve waited in line for 20 minutes to over an hour just to check in, depending on how complicated the situations were of the people in front of me in line. Then it takes about 30 minutes to get everything taken care of once you are actually at the desk. Last time I flew, I was there “only” an hour and a half early and was sternly admonished by the airline representative about my tardiness (not a great way to start out at 6:00 a.m.). Next: do your best to remain calm throughout your day at the airport. Take your pet on a long walk before the trip and consider talking to your vet about a plan in case your pet is very stressed during travel (maybe a thunder shirt!). One time while going through security, after taking Stevie out to go through the metal detector in my arms, I was told to “Please put my dog away now.” So I proceeded to do this, after which I heard “Please remove the carrier from the table.” A little flustered since there were people behind me and I still needed to grab my computer and put on my boots, I grabbed Stevie in her kennel and put it around my neck. As I tried to grab my stuff to get out of the way, the security attendants then told me to “Put the kennel on the ground.” Confused, I put it on the ground and looked at them questioningly. Then they said, “Please remove your items from the table.” I had to take a couple deep breaths to keep myself from shouting “THAT’S WHAT I’VE BEEN TRYING TO DO!” But its important to remain calm for you and your pet’s sake, because they can feed off of your mood and can become more anxious. Finally, I want to tell you to make sure to bring supplies for your dog. By supplies, I mean food, water, bowls, a chew toy or bone, their favorite toy, a kennel, and most importantly, puppy pads or paper towels. You have to remember that your dog might have an accident during your day of travel, especially if you’re traveling with a puppy. The second time I flew with Stevie, we were walking to our gate and she stopped and squatted! I was so embarrassed because people walking right behind us that had to divert their path; the lady following us even averted her eyes! Poor Stevie was so nervous and confused, she just had to go right then. While I have not gone over everything that is necessary when traveling with a pet, I think I’ve covered the basics. I have had great times traveling with Stevie, and it definitely makes my day when I see people’s reactions to seeing her cute furry face!